One listen to Canadian rock group Red Umbrella's debut on 7 Spin Music, Wishing For Boardwalk, and you realize that you've stumbled across that rare combination of smart lyrics and inspired, artistic music. From the opening strains of Storm Warning, and the driving Straight Jacket, to the anthemic Already Won and Home, among others, this project speaks to the breadth and depth of the Christian faith, while marrying the message to melodies that will be swirling around your brain for hours after you've turned off the music. But as complex as it may sound, Wishing For Boardwalk drives home the simple point that every human being has one thing in common - an unspoken longing that only God can fill. The members of Red Umbrella didn't set out to create an album centered on a common theme. As lead singer/guitarist Jeremy Michaelis explains, "It was something we noticed after the record was written. The song 'Wishing for Boardwalk' is kind of like the idea that everybody knows they have that certain thing that they are wishing for. Ultimately, the idea is, like C.S. Lewis said in "The Problem of Pain, it's kind of this longing that everybody has, this yearning that, if you try to grab hold of it, disappears. If you push to discover it, you'll be lead towards God and Christianity, ultimately. It's kind of the God-shaped-hole concept, but it's not that simple. Everybody knows what it is, and it's not meant to have its fulfillment in anything but God." Most of the members of Red Umbrella grew up together in Parry Sound, Ontario. Jeremy and brother Dennis Michaelis (keyboards and guitar) and drummer Jason Rosewell went to the same church. Bassist Kevin Swartwood was born in Parry Sound and his family came back every year to stay in a cottage on a local lake. "We went to the same youth group and played on worship teams at church," explains Jason. "We were looking for a bass player, heard that Kevin played, so we called him up and asked him to join the band." Right away, the group began writing its own material. Although each member has a variety of musical influences, the common sound that emerged owes some debt to their shared love for a certain iconic Irish rock band. "I think we all really liked U2 when we started," says Jeremy. "With that being said, we knew what we didn't want to sound like," continues Jason, "and that was too much like U2 or Coldplay, or anyone else. We're trying to really be distinct, as much as possible. We like those influences, but we don't want to be completely in a box. But every band is usually compared to somebody, and if we are going to have comparisons, those are good ones to have." A quick listen to the album shows that Red Umbrella has succeeded in not completely pigeon-holing themselves, although there is a decided Brit-pop influence, with flashes of everything from The Killers, to the Beatles, to Oasis. The common thread is the eminently hum-able melodies and the soaring sound, which is even more impressive when you realize that most of the album was produced by Jeremy and the rest of the band, with several songs ("Already Won," "Elevator," "Slide") produced by Quinlan and one song ("Storm Warning") produced by Rick May. The creative process generally starts with brothers Jeremy and Dennis. "Sometimes I'll start something or Jeremy will start something, and then we'll finish it off together, or separately," Dennis says. "Jer does more of the lyrics than I do." "We have a studio at Dennis and Jeremy's house, where our practice space is, and it's where we recorded a lot of the album," Jason explains further. "So usually they will record something with a drum loop and then we'll turn it into a song as a band, and see how it goes." 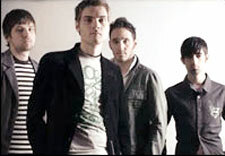 Growing up in church, all of the Red Umbrella band members were exposed to, and fans of, various Christian artists. But this album is their first attempt at making a more specific Christian statement. As the primary lyricist, Jeremy admits that this was something he had to be somewhat deliberate about. "Prior to this record, I was writing all sorts of random, poetic things. But I prayed throughout the making of the album, that God would give me things that maybe were more appropriate or more real. I never wanted to say something because that's what somebody thought should be said, but because it was true." "We wanted this album to encourage Christians, but we didn't want to alienate non-believers, in hopes that maybe sometime our lyrics would make them ask questions and see what we're really talking about," Kevin elaborates. "So there was a conscious effort to limit the 'Christianese,' and not just say things in a way that people would expect." This is a band that prefers to talk about their faith, as opposed to singing about it in simple songs. "Some of the songs are ambiguous in certain ways, but when somebody asks me 'what does this song mean,' it's nice to talk to somebody and explain your faith, rather than have them hear "Jesus is Lord" in a song," explains Jeremy. "It gives me a chance to talk to someone about what I believe, to go deeper than you can in a song. But the problem is when people think that's all there is. The band hit the road hard in 2005, playing more than 120 dates as they criss-crossed the States several times, including tours with Seventh Day Slumber and their label-mates Playdough and Sevenglory. As they've played in front of every sort of crowd imaginable, the group has honed in on who they think their audience really is. "We generally get a good response from most audiences, but I think we get the biggest connection with the college age/young adult, 18 - 35 year-old group," says Dennis. "That's when we get the most people coming up to us and wanting to talk afterwards." "If I'm talking to people my age, or college-aged, they are facing the same things that I've dealt with over the last few years," says Jeremy. They have this simple faith that is getting destroyed by their professors at college. And it doesn't have to be like that. There is a very rich, logical, understanding that you can have as a believer, and I love talking about those things." If Wishing For Boardwalk is any indication, this band should have lots of opportunities for those kinds of conversations in the next few years.